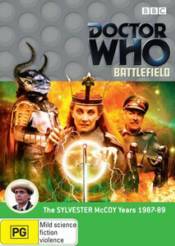 Featuring Sylvester McCoy in his final season as the seventh Doctor and Sophie Aldred as assistant Ace, BBC DVD is proud to announce the release of the classic tale Doctor Who: Battlefield. When the Doctor and Ace respond to a mysterious distress signal, they find themselves in the Earth village of Carbury. The strange goings on at a nearby archaeological dig at Lake Voortigen � the mythical resting place of Excalibur, King Arthur�s sword - have already attracted the attentions of UNIT. Brigadier Lethbridge-Stewart has even come out of retirement to assist in the crisis. Soon a battle between the mythological characters of Arthurian legend is raging, but why do they all refer to the Doctor as Merlin? Commentary - stereo. With actors Sophie Aldred, Nicholas Courtney and Angela Bruce, writer Ben Aaronovitch and script editor Andrew Cartmel. Storm Over Avallion - cast and crew talk about the making of 'Battlefield'. With Actors Sylvester McCoy, Sophie Aldred, Nicholas Courtney, Jean Marsh, Angela Bruce and Marcus Gilbert, director Michael Kerrigan, writer Ben Aaronovitch and script editor Andrew Cartmel. Past and Future King - Ben Aaronovitch and Andrew Cartmel look back at how the story was commissioned and written, with additional comments from Sylvester McCoy, Sophie Aldred, Nicholas Courtney, Angela Bruce and Michael Kerrigan. Watertank - illustrated with behind the scenes footage of the actual event, Sophie Aldred and members of the cast and crew recall the on-set accident that happened during the making of 'Battlefield', when a glass water tank shattered with Sophie still inside it. With Sophie Aldred, Sylvester McCoy, Michael Kerrigan and Andrew Cartmel. Studio Recording - behind the scenes on the studio recording of Battlefield, taken from a VHS tape made from the live studio output. From Kingdom to Queen - actress Jean Marsh looks back on her three appearances in Doctor Who. A brand new movie-format version of the story, with a 5.1 soundtrack re-edited into the original script order and previously unseen footage.